Versatile tools and requires less effort to hoover around. 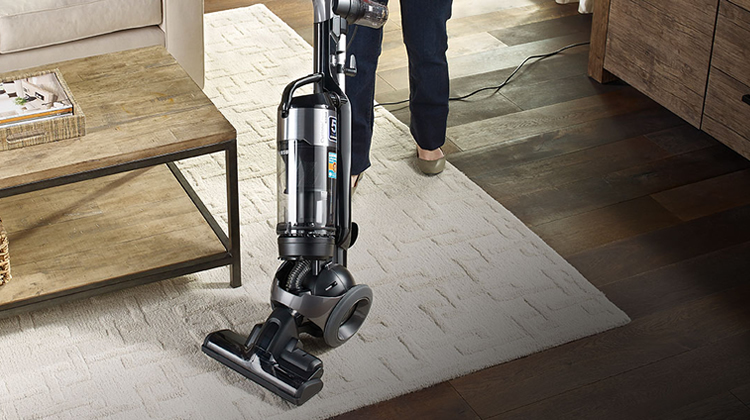 Make easy work of carpets and hard floors with an upright vac that doesn’t require you to bend down, making it easier on your back. They generally have all the tools on board to clean every inch of your home. Here are 10 of the best upright vacuum cleaners for 2018. You can also read our summarized reviews of all featured upright vacs here. 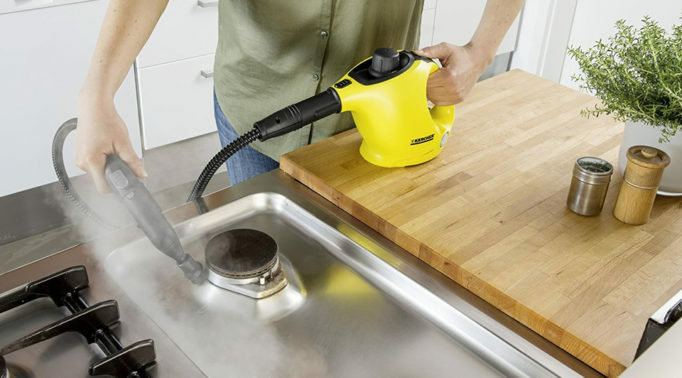 Looking for a powerful vac that’s a bit more affordable and portable? 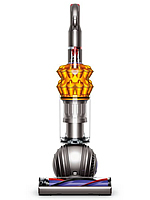 Then take a look at our best cylinder vacuums instead. Carpets – Is it suitable for cleaning carpets? Hard Floors – Is it suitable for cleaning hard floors? Pet Hair – Is it effective at cleaning pet hair? Certain upright vacuum cleaners either have a specialised brush roll or/and includes tools to help remove pet hair. 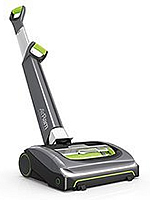 Air Watts – This directly relates to the suction power of the handheld vacuum. The higher the amount of air watts, the more suction power it has. Battery Type – The majority of cordless vacuums will either use Nickel Cadmium (NiCad) or Lithium Ion (Li-Ion) batteries, with the latter proving to be better when it comes to charging abilities and lifespan. 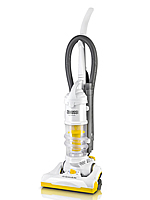 Charge Time – How long does it take for a cordless upright vacuum to reach a full charge? Certain models require an initial prolonged charging period straight out the box and subsequent charges will be a lot shorter. Run Time – This is based on consistent non-stop use on a full charge. Capacity – How many litres of waste can the vacuum’s waste tank hold before you have to empty it? Corded models usually have a much bigger capacity than cordless models. Filter – What type of filter does the vacuum have? 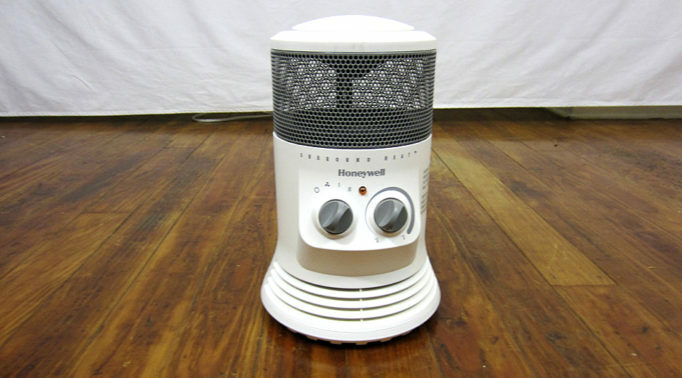 Certain models have a HEPA (high-efficiency particulate arrestance) filter which is designed to trap tiny particles that trigger allergy and asthma symptoms. Hose – Many corded upright vacuums have an integrated hose that allows you to easily reach into various areas for cleaning. 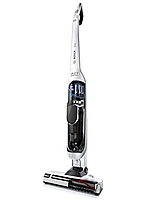 Many of the best upright vacs can swivel and turn corners effortlessly. Finding the best upright vacuum cleaner for your needs can appear daunting, but it is easy if you have a good knowledge of the latest innovative features and added extras. There is a wealth of available options as shown in our latest upright vacuum cleaner reviews, and this article serves to give clear and concise information and tips on the exciting cutting-edge uprights to help you find the right one. This includes information on sealed systems, HEPA filters, suction control, long power cords, accessories, bagless models, maneuverability, and other benefits which make hoovering pleasurable, quick and highly effective. Vacuum cleaners which boast a sealed system offer a great advantage in that all of the particles, allergens and dirt are suctioned straight into a bag with a robust automatic seal closure. This type of system offers another distinct benefit: when air is expelled during vacuuming, it’s much cleaner to breathe in as there are several filters within the sealed bag that trap all the adverse elements. 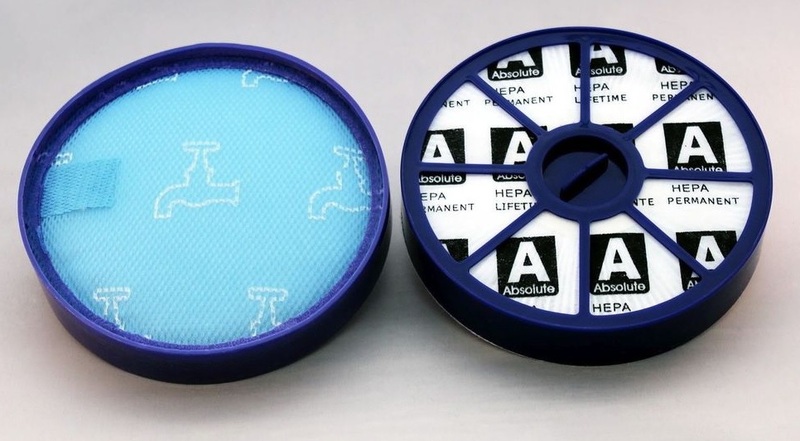 So a sealed system is perfect for individuals who have breathing difficulties and suffer from airborne allergies. 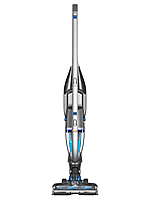 The best upright vacuum cleaner models with this system feature an indicator showing when the vacuum bag is full, and this is very helpful and stops users overfilling it and suffering from inhaling the fallout. Some models even boast a bar code on the interior so that it can be scanned with a smartphone to make re-ordering accurate and avoid buying the wrong bags. State-of-the-art sealed system models which have a HEPA (high efficiency particulate air) filter are highly recommended as they control the emissions from the vacuum. There are many positive upright vacuum reviews in regards to this. 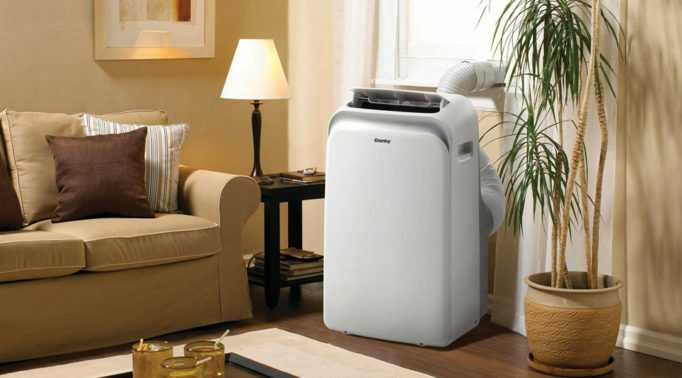 Anyone suffering from asthma or allergies should go for a hoover with a HEPA filter; this way they can avoid exasperating their condition by breathing in the dust and dirt which the hoover blows up into the air right after it is suctioned up. A HEPA (High-efficiency particulate arrestance) filter is designed to remove 99.97% of particles that have a size of 0.3 micrometres. Furthermore, these filters have been rigorously tested to eliminate unwelcome allergens such as dust, smoke and mold from the environment. While all forms of filters do this to some degree, HEPA filters have to entrap a minimum of 99.97% of particles. The filter is easily removable, and until a replacement is needed, it can be simply cleaned using water. 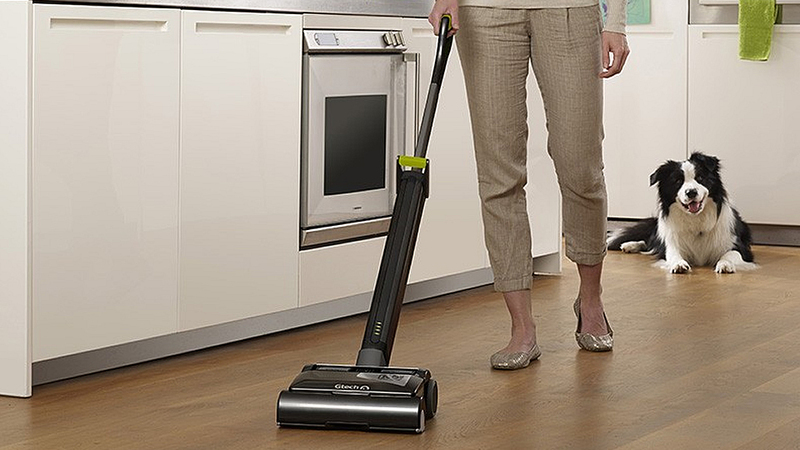 Some bagged and bagless upright vacuum cleaners offer suction control. This option can be extremely helpful as it enables users to clean a number of fragile fabrics such as sofa and cushion covers, bedding, and fine rugs and curtains, without being concerned about causing any damage, no matter how many times a week it is used. Models with long power cords save time as it is not necessary to keep putting the hoovering on hold to change electricity sockets. Another helpful addition is a long extendable hose. A number of models sport 15 feet plus telescoping hoses which are sufficient for the majority of staircases. It also allows an excellent reach when cleaning above the floor, and attending to large open carpeted areas and long hallways. 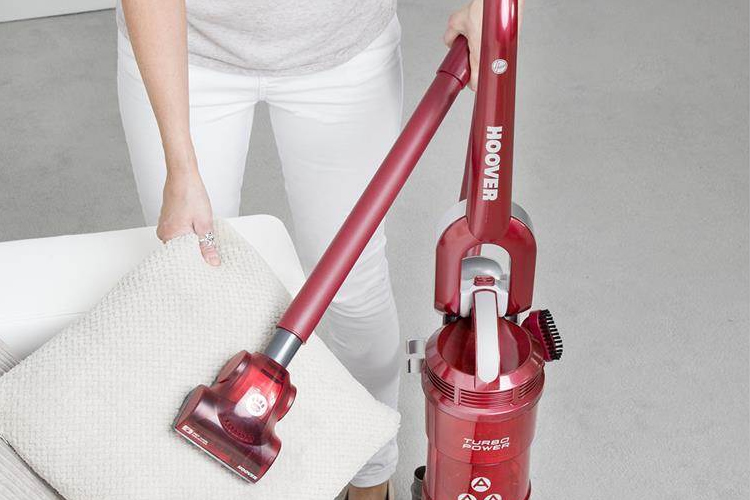 A lightweight upright vacuum cleaner is ultra-portable and the best choice for anyone who finds lifting difficult, especially if the hoover has to be carried up one or two flights of stairs. Swivel steering is another major plus, as it prevents fatigue and makes covering difficult areas and large spaces a pleasure. A pet tool turbo brush used for hoovering pet hair from upholstery and carpets. A number of vacuum cleaners have excellent flexibility adjustments which allow them to easily pass under items of furniture and tables. However, in order to hoover under items such as sofas, an added extendable hose is essential. There are also various tools such as a dusting brush and an extension wand for cleaning furniture including dining chairs, footstools, mattresses and sofas, and these can be added to the hose. Another effective tool is the compact dusting flexible bristle brush which is great for blind maintenance as it easily glides between the rungs, and is effective for computer keyboards. A crevice tool featuring a narrow end is another first class gadget which makes removing cobwebs and pieces of cat litter from the most difficult areas really easy, and is really useful for cleaning detailing furniture, car seats and carpets, and difficult to get to trouble spots. Firm bristle brushes and dedicated pet upholstry tools are very effective for eliminating dirt, human hair and cat and dog fur. Turbo tools on some models boast a roller with rubberised bands dedicated to scraping off pet hair from the stairs and furniture. 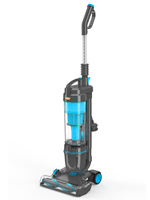 The advantages of bagless upright vacuum cleaners is that they save on the cost of bags even though you still need to purchase filters; you do not have to put them in and take them out, you can see when they are full up, and they are incredibly easy to empty. 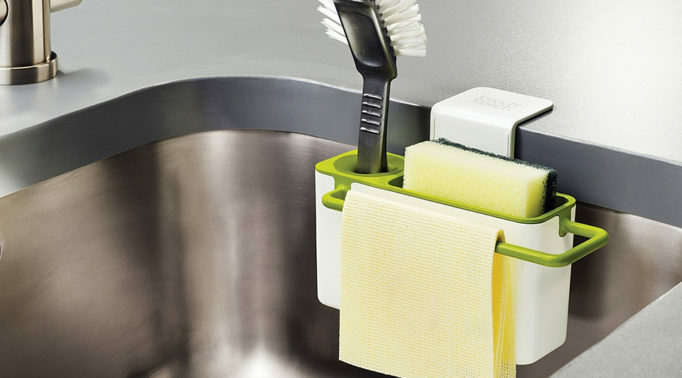 Emptying only takes a matter of minutes as users simply disconnect the canister from the cleaner’s base, and then place it over the garbage bin outside the home while pressing the eject button. 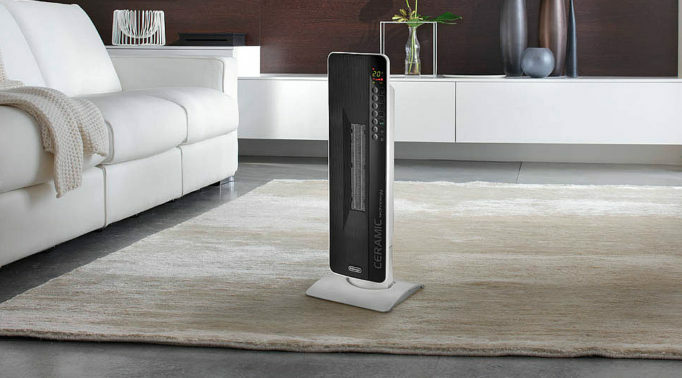 This avoids air contamination within the home. The same thing goes for emptying bags or bag-less dust containers, as with a canister it means bending to the ground, whereas with with a stick vacuum cleaner, that does not apply. 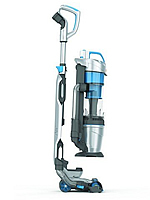 Upright vacuum cleaner models also offer a height adjustment facility, a dial to change the height of the nozzle, a retractable cord, more options and accessories such as unique tools, self-propelled motors, an off-on brush roll, a range of filters, and an upright dust bag fitting which can hold more than a canister hoover. 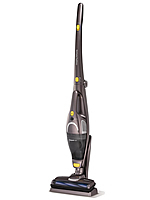 Warranties for upright hoovers vary and number of them offer a 5 year warranty. This gives you peace of mind just in case anything does go wrong within that long time frame. 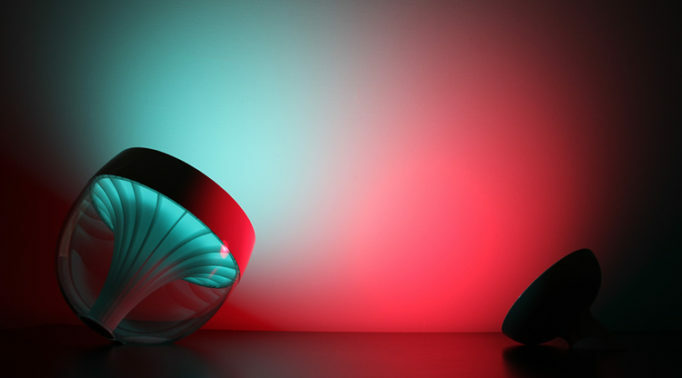 It also shows that the manufacturer is confident in their product. Though both are technically “upright vacuums”, there are distint differences between an upright and stick vacuum – portability and corded/cordless being the most notable. Although both designs are technically upright vacuums, there are distinct differences between the two. The upright models are most effective on thick pile carpets and rugs, and some of them can make a transition from carpet to tiled or wooden floors. 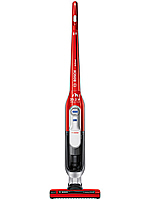 Conversely, a stick vacuum cleaner is a lightweight streamlined form of upright (not much different from a handheld vacuum with a wand attachment), and is good for small areas and effective spot cleaning as it is less powerful and fueled by a battery, so this makes them suitable for vacuuming the car and other places where using a corded vacuum would be difficult. They work in virtually the same way as a corded model, but they often do not come with any added accessories or attachments. Some stick models feature a fuel gauge so that users can see how much battery life is remaining and if they have to re-charge. There is also an option for effective Wind Tunnel technology as well as operating controls which respond to the fingertips. As they take up minimal space, they are easier to store on a shelf or in a cupboard, and can be kept in the car boot for quick access. They do not have as much power as the upright models as the engine is smaller. A few brands are actually convertible and can be used as both a handheld vacuum and a stick vacuum. This can be useful when someone just wants to get hold of the stick version to whisk away some dirt or crumbs within seconds. 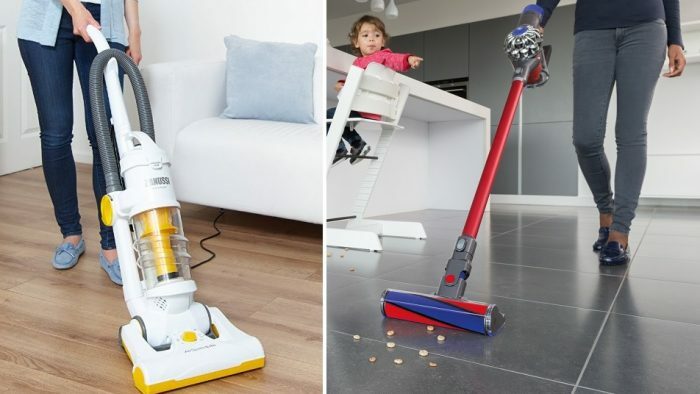 Upright and stick hoovers take up far less storage space than a canister vacuum and even before hoovering, users adore the convenient way an upright slides out of the cupboard at the tough of a hand. They really appreciate that they can effortlessly glide it over the carpet and then just wheel it back to where it came from. The models which are self-propelled are particularly popular as they make wheeling it super easy in both forward and reverse mode. Many uprights also integrate the manoeuvrability and range of their counterpart canister vacuum thanks to a lengthy cord and a selection of attachments. 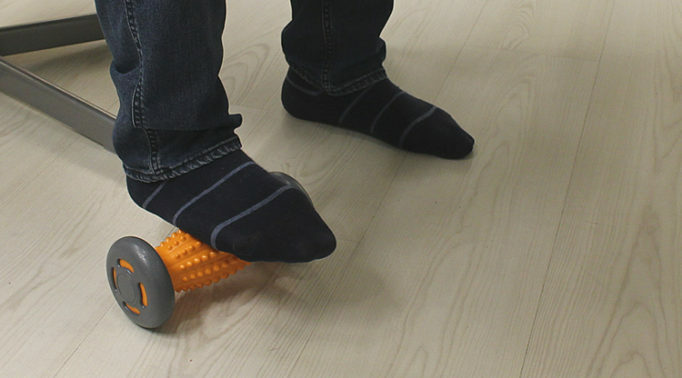 Another great advantage is that by just tapping the upright hoovers foot switch, the function mode can be changed to a carpet beater head or a bare floor static suction – great news for anyone with a bad back or osteoporosis. 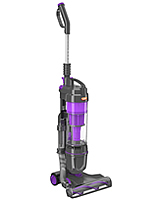 In order to get the very best upright vacuum cleaner to suit you and your interior floor and furnishings, think about whether you need a lightweight upright vacuum cleaner or a heavier sturdier model, if you would prefer a bagged or bagless design with or without a HEPA filter, and if you need attachments for suction, dusting and removing hair and fur from difficult to reach areas. If you have pets in the house of car they need to be considered as well. You can then follow that short list with the other valuable benefits you need, and then buy yourself a terrific upright hoover that meets your demands. You will be delighted that hoovering with a top of the range model and enjoying a spotlessly clean healthy dust free home with your family can be a real pleasure.